Does an interrupt count as an instant? Rift Bolt or Lava Spike instead of Lightning Strike ? Or even Skewer the Critics ? Appart from that, not much to say, this looks cool and well balanced. Nice choice of creatures too. 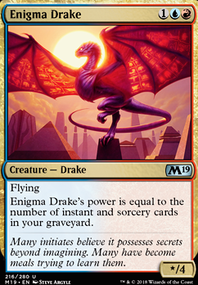 For the late game you could try Enigma Drake . 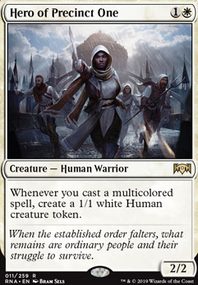 I see that this deck is one that you built from cards that you have, I don't know if you are aware of all the cards that are in the standards sets, and for that I suggest that u go to gatherer.wizards.com and use their card search to find cards with abilities, etc. 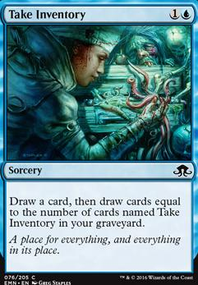 that you would like to include in your deck. Next, I would advice you to streamline your deck. Understand what your win condition is and build a deck around that, with cards that synergise well and do not hinder their abilities. 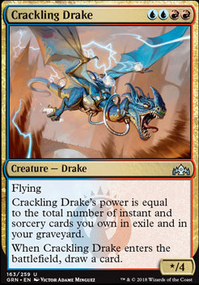 Your Crackling Drake and Enigma Drake can be seen in your deck to somewhat contradict themselves by having one take their power from the graveyard and the other from the exile pile. Focusing one one drake could result in a better outcome for your deck as it will result in your deck snapping to either having the Izzet's Jump-Start ability be a main mechanic for your deck or just a gimmick of one or two of your cards in your deck. Lastly, realise a smooth mana curve. Quantities of your cards need to be balanced in terms of amounts needed to reliably draw it and how much that card is needed to win. 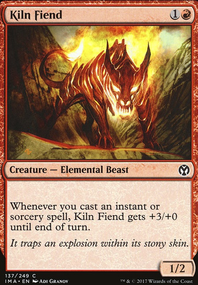 Some cards can be substituted for other cards that have the same function, but costs less. I'm not going to lie, your deck needs a lot of work, but I would rather have you do some research, come up with ideas about what you want, and what could work and then write a synopsis of your deck so I know what your basic game plan is and how all the synergies in your deck work and not a flat I don't know. By you doing that, all the help can mean mounds more than what you will get at this stage. I can and I'm willing to help, but not with what you are giving me at the moment.